You wouldn't know it for the huge amount of garlic I grow every year, but I used to hate garlic. What won me over to the anti-vampire side of the cooking fence was roasted garlic. When you cook whole cloves without breaking them apart, the result is sweet and mildly garlicky, without the bite of minced garlic. In recent years, I've learned to love the bite, but I'm working on a roasted garlic hummus recipe, so I figured I'd learn to roast garlic the right way. It's surprisingly easy. Clean a dozen or so heads of garlic (assuming your skins are still a bit dirty from the garden, like mine), then chop off the tops so that the tips of most cloves are barely exposed. Drizzle a bit of olive oil on the exposed skin and bake in a 350 degree oven for about an hour. Once you can handle the heads again, squeeze out the roasted cloves. You'll have much better luck roasting softneck garlic than hardneck for the simple reason that it's tough to cut the top off the latter. And why waste those easy to skin, huge cloves on this recipe when trouble heads with two dozen tiny cloves are so easy to roast? You can squeeze the guts out of a head of garlic in seconds, no matter how many cloves are present. Use your roasted garlic in any recipe that calls for regular garlic, but add a lot more of it. 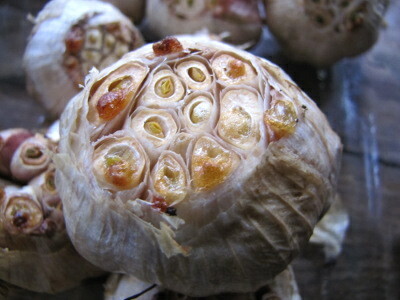 (About a head of roasted garlic will replace a clove of raw garlic.) Enjoy! Hmm... 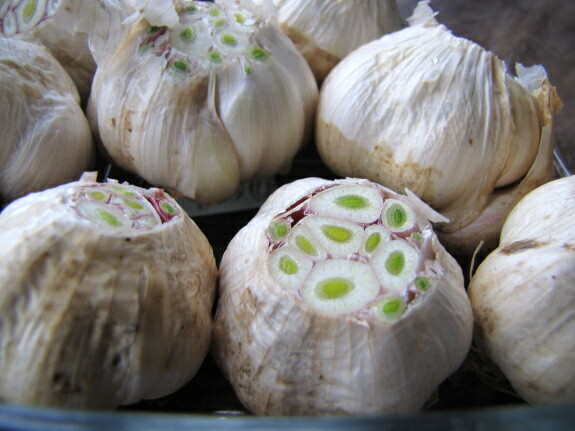 I never really thought of garlic having bite... Perhaps my palate is a bit different having grown up in "Cajun Country". But when I think "bite", I think Cayenne, Jalapenos, really strong onions, etc. I'm a wimp when it comes to spicy food. I don't eat cayenne or jalapenos, and only eat onions cooked (except for the milder green onion leaves.) I guess it's all in your frame of reference.